Poker players, no matter if they’re fresh faces or seasoned veterans, can get caught chasing a high-ranked hand. Going for the big hand in poker tournaments can often times leave hold’em players blind to a low-ranked hand, which may not be as strong but is sure as heck easier to make. 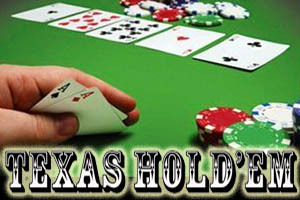 The flush is one of the stronger hold’em hands to make and isn’t that rare where you’d never have a chance to get it. However, if you’ve got a flush draw – which means you are one card from hitting the flush – after the flop, there’s just under a 35 percent chance that you’ll make that hand. That means you’ll get your flush about one out of every three tries. Doesn’t sound too bad in the short term, but chasing the flush looks a lot worse when it’s four for 12 over the course of a tournament – that’s eight losing hands. Drawing a pair on your hole cards quickly gets the blood bubbling, knowing that you have a shot at making three of a kind. But, when you consider that you have a 15/2 shot at picking up that third card before the flop, players may want to back it up a bit and be very cautious chasing the set, especially when it comes to leaning on the turn or river to give you three of a kind. Chasing the set in smaller pots or with a high pair may be the best way to go if you just can’t help yourself. Whether you drew a pair in the hole or are sitting with two or three of a kind following the flop, chasing the full house can get you in deeper than you’d like. Depending on the pair – or if you have the three of a kind – you should gauge your play accordingly, and not wager based on cards you don’t have yet. If you have a pair post-flop, the odds of drawing at least a full house on the final two cards is 16.74 percent. If you’re looking at three of a kind, those odds go to 33.4 percent – basically 1/3 – of pulling a hand rated at least as low as a full house.